WalkDenver has a lot of thank you’s to hand out this year! Happy Thanksgiving everyone! It’s that time of the year when we take a moment to reflect about the past year and all that it has given us. In 2018, we have had some wonderful opportunities to work with communities all over Denver. Thanks to their enthusiasm, dedication, and support, we have been able to accomplish some amazing things here at WalkDenver and we couldn’t be more thankful. This time last year, we were wrapping up the second cohort of Project Shift, the leadership development program for residents who want to change the ways Denver gets around. After 35 individuals completed a total of 19 sessions and 8 neighborhood projects, Project Shift came to a close at the end of 2017. Since then, we’ve been crunching the numbers and following-up with our graduates to see what the impacts of Project Shift have been. The result is our brand-new Project Shift Final Report, which is now available to read here! Using lessons learned directly from Project Shift, we will continue to work towards a more multimodal, active, and healthy city through neighborhood-based initiatives like the Vision Zero Community Program. Thank you to all the wonderful participants who made Project Shift such an enjoyable and memorable experience! 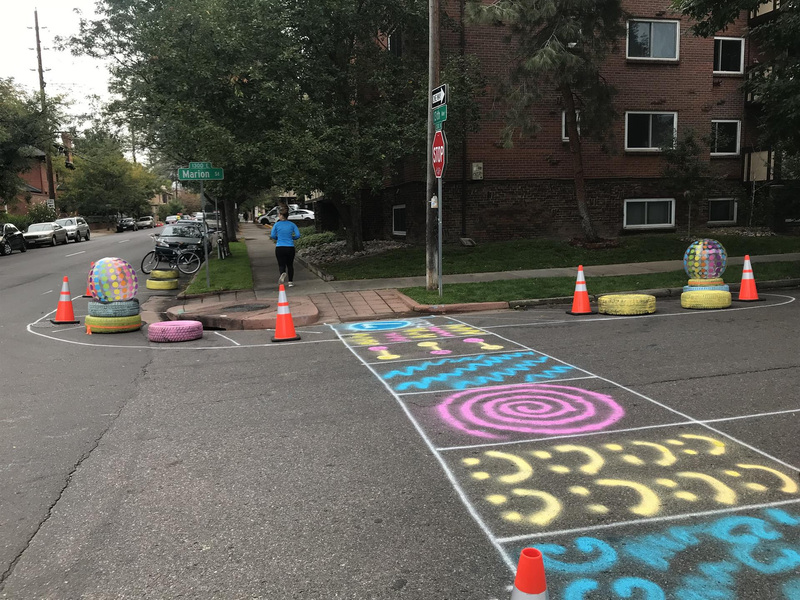 When the Capitol Hill United Neighbors (CHUN) contacted WalkDenver about how to address the issue of speeding in their neighborhood, our recent experience with Project Shift gave us an idea: why not try a pop-up traffic calming demonstration? After seeing how some cones and hay bales helped make it easier for pedestrians to cross the street at a Five Points intersection, we thought we could work with CHUN to do the same thing on 13th Ave.
On September 29, CHUN and WalkDenver hosted a pop-up demonstration on 13th Ave at the intersections with Marion and Lafayette Streets. Using cones, painted tires, beach balls, and some spray chalk, we set up “bulbouts,” also known as curb extensions at the corners of each intersection to increase visibility of pedestrians and give them some more space on the street while also signaling to drivers that this is a neighborhood street where they people are walking, biking, and enjoying local destinations. Volunteers came out to help us measure morning and afternoon speeds along 13th both before and during the event to see if the bulbouts had any effect. The results were very exciting: not only did overall speeds go down, but we found that the percentage of drivers going over the speed limit was dramatically reduced from 23% before the pop-up to 8% during the pop-up, and held steady from the morning to the afternoon even as traffic volume increased. Meanwhile, feedback from pedestrians passing by was overwhelmingly positive. Of the 98 people who took our survey (84% of whom live in the area), a whopping 91% said they felt that bulbouts would make it safer and easier to cross the street. Thank you to the CHUN members and volunteers who helped with the planning, preparation, and data collection that made this event such a success! Big problems require big ideas – especially when the problem is one of the biggest and most dangerous intersections in Denver: the Colfax and Federal cloverleaf interchange. This highway-style design is emblematic of Denver’s car-oriented past but could also be an opportunity for a more multimodal future. And the West Colfax neighborhood showed it could dream big. In June, West Colfax had the opportunity to see what this area could look like as a safer and more accessible part of their community. Volunteers helped us build a raised crosswalk, paint roll-out crosswalks, name pop-up streets, bring in trees and plants, and paint a pop-up bike lane. 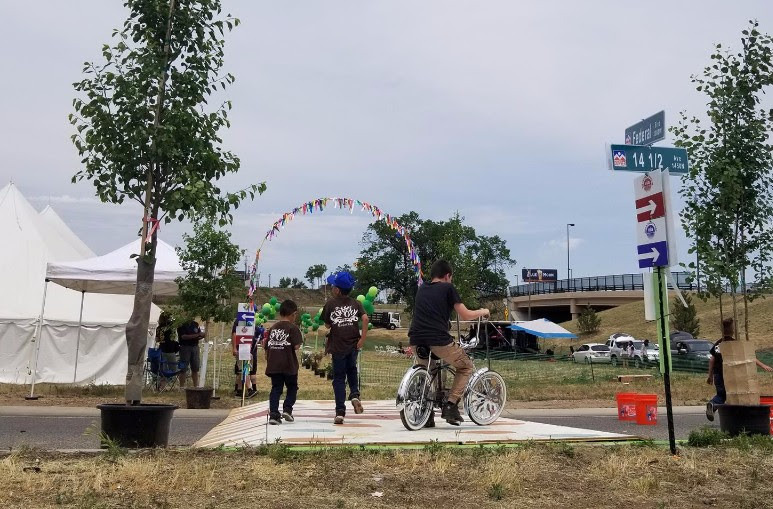 All of these elements came together on Sunday, June 3, for the Over the Colfax Clover neighborhood festival that offered not only fun, food, and live music but also a chance to see what both short-term safety improvements and more long-term visions could bring to the area. Check out video of the event! Thank you to our project partners at the West Colfax Business Improvement District and planning firms Michael Baker International and Critter Thompson Consulting, as well as all the volunteers, sponsors, vendors, partners, and the estimated 500 attendees who helped put on such a great event! Sometimes community members are ready to lead the call for safer streets themselves, and we were excited to be included in their efforts. 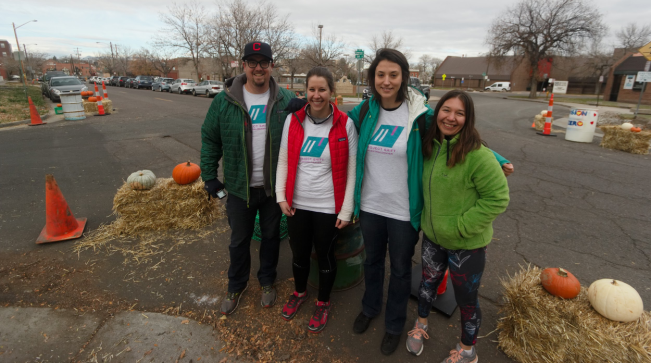 This year, we helped organize two leadership walk events where decision-makers could experience firsthand what conditions are like for those who regularly travel Denver’s most challenging corridors outside of a car. In the spring, Montbello resident and GirlTrek leader Pam Jiner teamed up with WalkDenver, Walk2Connect, and Stanford University’s Our Voice initiative to organize a walk audit of Peoria with a large group of decision makers and local leaders, including representatives from city, state, and regional agencies. 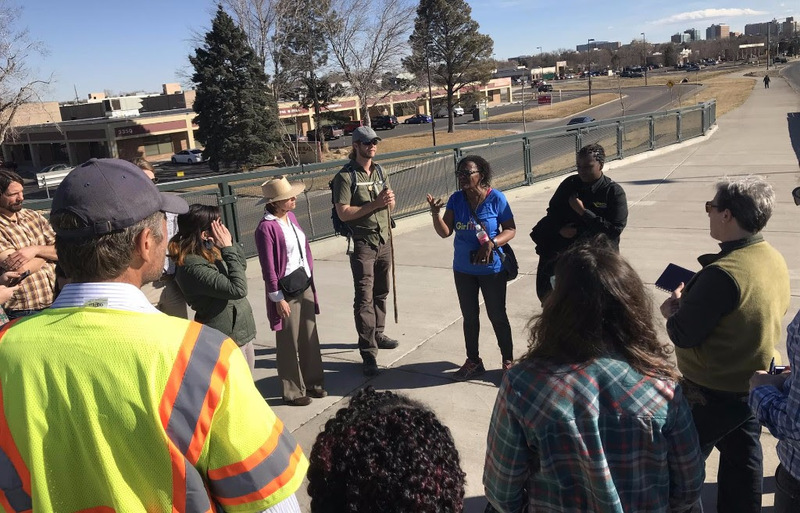 Inspired by the walk on Peoria, the Regis University Community Council organized a similar resident-led walk to highlight the traffic safety issues facing people who walk, bike, and access transit along Federal Boulevard in northwest Denver. Both the Peoria and Federal walks were eye-opening experiences for many attendees who are responsible for maintaining and operating these roads. Thank you to the dedicated Montbello, Regis, Chaffee Park, and Berkeley residents who stepped up and spoke out about the traffic safety issues important to their communities! 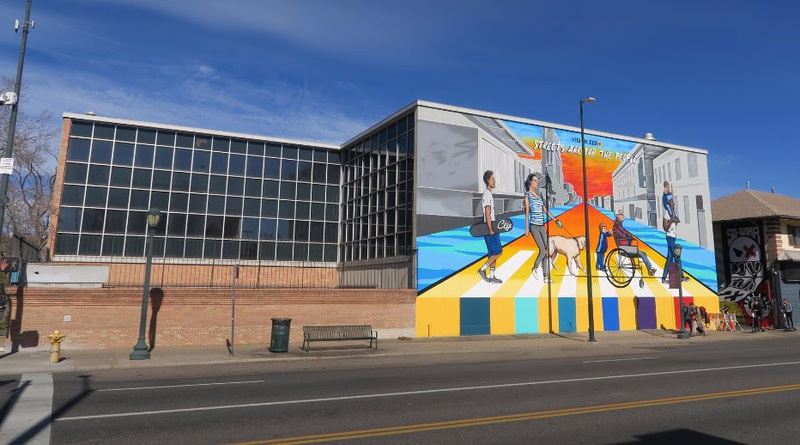 WalkDenver is proud to be a founding member of the Denver Streets Partnership (DSP), a coalition of community organizations advocating for people-friendly streets in Denver. We’re even prouder of the amazing community members who continue to show up to support safe streets for all of Denver. After re-launching the partnership with a call to Mayor Hancock for safer streets in Denver, we took our campaign to the public. We heard from over residents, workers, and organizations all over the city who signed postcards and wrote letters to the Mayor and City Council asking them to dedicate funding in the annual City budget for safe streets. Around 70 people came with us to help us deliver these messages in person to the City and County Building on August 21. 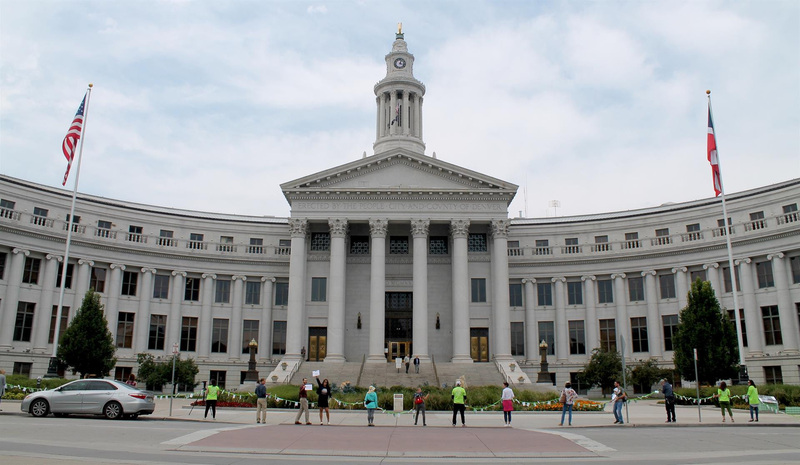 Thank you to the over 600 people who signed a postcard or wrote a message in support of safe streets for Denver, and thank you to the Mayor and City Council for continuing to increase the funding for walking, biking, and transit in the City’s annual budget! Achieving the Vision Zero goal of eliminating traffic fatalities and serious injuries will require not only redesigning our streets to be safer for everyone, but also a cultural shift in how we think about streets as public spaces that belong to the people of Denver, not just conduits for cars. This cultural shift was the inspiration for our Vision Zero Community Art Project. Working in partnership with local artist Pat Milbery, East High School Art Students, residents, and businesses, we decorated 14 utility boxes along the East Colfax corridor with stories of people who had been killed or impacted by traffic crashes, installed a large scale Vision-Zero themed mural on the City-owned building at Colfax and Washington, and began distributing artistic yard signs that encourage drivers to “Slow the Funk Down.” Thank you to all the amazing artists, students community volunteers, and partners at the City that helped make these projects happen! Thank you to our WalkDenver supporters! As you can see, we have a lot to be thankful for here at WalkDenver, and that includes you! Thank you for taking the time to support WalkDenver by reading our newsletter, volunteering at our events, participating in our advocacy efforts, and contributing to our fundraising campaign. We are excited to continue working with communities all over Denver in 2019 with the goal of ensuring safe, healthy, affordable transportation options for all Denverites. Next post: WalkDenver is hiring a Neighborhood Organizer!